This center has a great distinctive role in research and development a large scale of medical equipment which non-sophisticated and simply used. With the skill and appropriated technology are able to provide the economy equipments among the country. Several medical instruments as Infant Incubator, Radiant Warmer, Phototherapy, TENS, Hydrocollator, Paraffin Bath, ECG Simulator etc. are allocated in the hospitals both public and private section. The repair and maintenance programme are served them also. Besides, the centre can design and perform the specific by order as well as the other medical products. However, the personnel who takes responsibility in this path still be required. Thus the graduate curriculum and short course training are conducted together. Those are focused on the performance in medical equipment management, design and construction, repair and maintenance. The students and trainees who have studied from the center will achieve themselves both experience and knowledge in biomedical instrumentation or field related. In the past several years, it can be mentioned that the center has contributed the society in term of medical products and skill personnel. The master degree in Biomedical Instrumentation has been conducted since 1980. At present, the 44 graduates work successfully in their careen path both in government and private section as the researcher, lecturer and consultant. They become the specialists in local medical equipment line. Most of them go to further study. 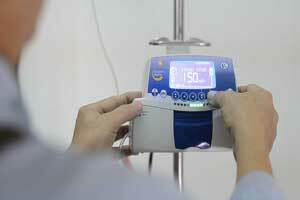 The training courses are provided for technician and personnel related the medical equipment. The courses are focused on the theoretical medical instrument and workshop. The trainees will clearly know about the function and how to solve the preliminary or secondary problems by themselves. In addition, we are the training center for the neighbour countries such as Union of Myanmar, Srilanka, Nepal, Putan which had been trained from us under WHO. Collaborating Centre for Biomedical Hospital Instruments at the Mahidol University.